The 10th ranked UNI Panthers visit 11th ranked Wichita State on Saturday afternoon to close the regular season and the winner claims the Missouri Valley Conference title. Both teams are 16-1 in theValley. “It’s the biggest game of the season, for multiple reasons. One, its for the conference title, two it’s on the road at Wichita State, I mean that’s pretty simple in itself. Three, it’s on their senior night, it’s on college game day, I mean I could keep going about it,” UNI senior foward Seth Tuttle said. 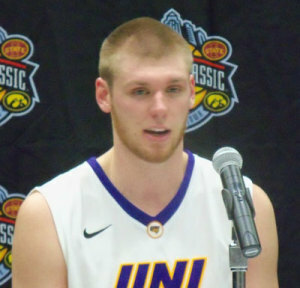 Tuttle scored 29 points as the Panthers rolled over the Shockers 70-54 in Cedar Falls in the first meeting. It snapped Wichita State’s 27 game Valley winning streak. “After getting the win here we know they are going to be ready to go. We know that that place is going to be a madhouse,” Tuttle says. Tuttle says getting a win at Wichita will be an even tougher chore. “That would be big time for out team and for our team and our program,” Tuttle says. The Shockers have won 31 straight games at home.